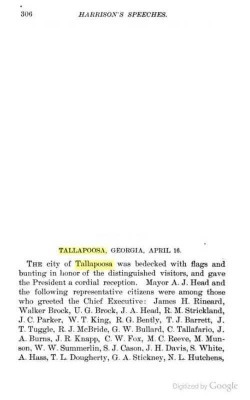 Tallapoosa greets US President Benjamin Harrison April 16, 1891. The building in the background, today gone, is the Tallapoosa Hotel, at the perpendicular intersection of Atlanta Street (left) and Head Avenue (right). Alabama Street runs on the near side of the railroad tracks, parallel to Atlanta Street. Historic photos like the one above are collected in the wonderful book, To Be Continued...A Pictorial History of Tallapoosa, Georgia (1999) available from the Tallapoosa Historical Society for only $20 plus postage. 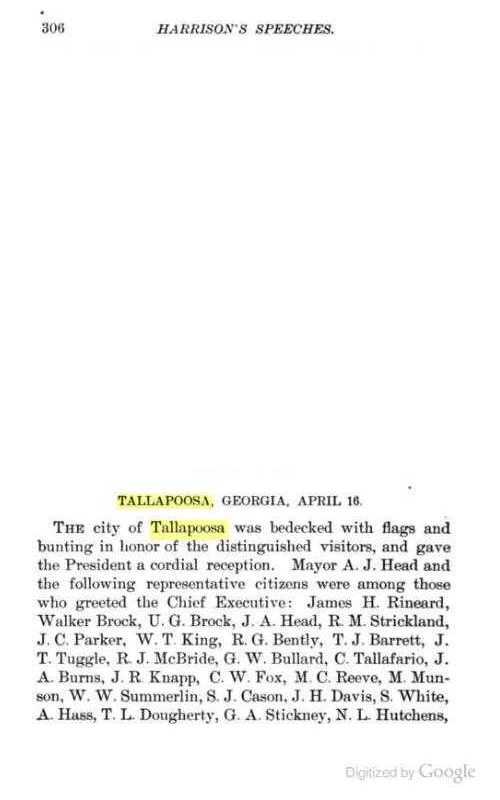 In 1884 the railroad came to Tallapoosa. Tracks were put down a half-mile south of the original Possum Snout settlement placing Tallapoosa on the direct line between Atlanta and Birmingham. Benjamin Harrison was the first US president to make a "whistle-stop-tour" across this country, giving as many as seven speeches per day. When his train stopped at Tallapoosa on April 16, 1891 he spoke at the south end of Head Avenue. This was not Harrison's first visit to Georgia. During the Civil War, as a brevetted brigadier general in the Federal Army under Sherman, Harrison commanded a Brigade at Resaca, Cassville, New Hope Church, Lost Mountain, Kennesaw Mountain, Marietta, Peach Tree Creek, and the Siege of Atlanta. Defeating Sherman's younger brother for the Republican nomination in 1888, Harrison lost the popular vote to Democrat Grover Cleveland by a small margin, but won the presidency in the Electoral College. 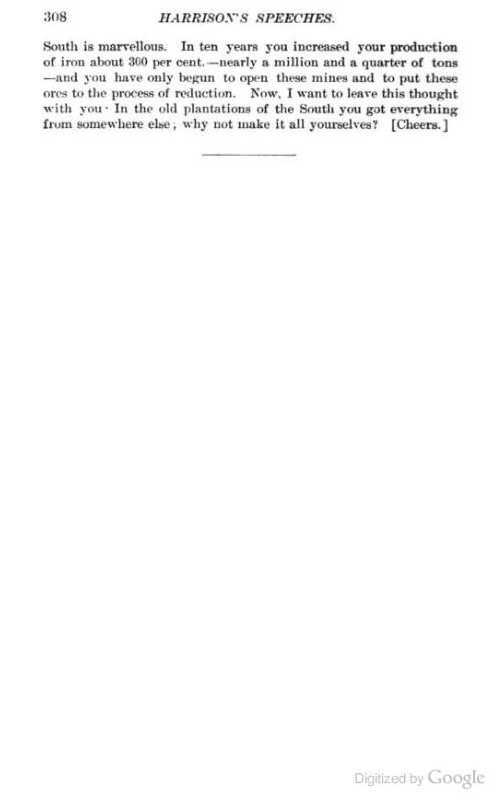 The December 2004 issue of Indiana Magazine of History includes an article by Edward Frantz, assistant professor of history at the University of Indianapolis, titled: A March of Triumph? Benjamin Harrison's Southern Tour and the Limits of Racial and Regional Reconciliation, which examines the motivations for Harrison's trek. 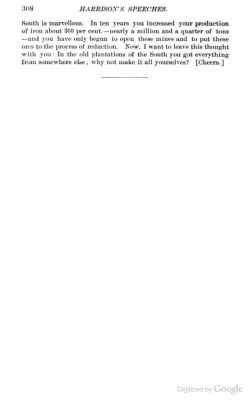 Read the full article online, which includes fascinating details of how and why the president modified his speech just before he brought it to Tallapoosa. Short, paunch-bellied, with the requisite bearded visage of his era ...as stubborn as a mule ...described even by allies as prickly. Harrison's whistle-stop-tour entourage included multiple family members: his wife, both his adult children, his daughter-in-law and a niece. 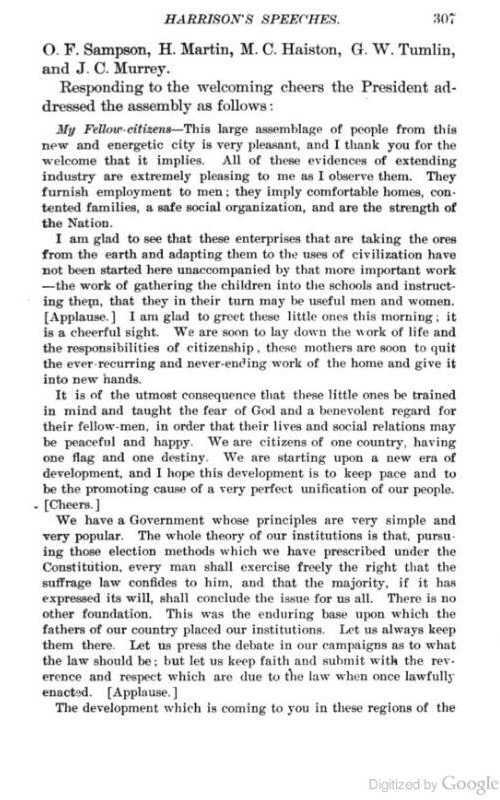 In addition, there were the following administration members: Postmaster General John Wanamaker, Secretary of Agriculture Jeremiah Rusk, and Marshal of the District of Columbia Dan Ransdell. Finally, also tagging along were a stenographer, the heads of the various railroads, and three newspaper reporters. At the 2007 edition of the annual Dogwood Fair in Tallapoosa, members of the Haralson County and Tallapoosa Historical Societies re-enacted the 1891 visit. Click the video below to listen to the only known sound recording of President Harrison (probably the earliest of any US president) presumably made sometime between 1894 and 1899 by Giuseppe Bettini. 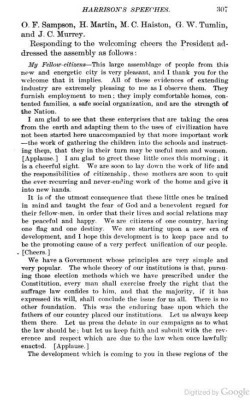 The text of President Harrison's Tallapoosa speech is reproduced below from the book Speeches of Benjamin Harrision, Twenty-third President of the United States: A Complete Collection... (United States Book Company, 1892).